It's not surprising Everett "Cotton" Owens would have a special gift for machinery. After all, his grandfather and father were both mechanics. But the idea of actually making a living out of racing automobiles? That seemed far-fetched at best. Born on May 24, 1921 in Union, S.C., Owens bought his first car when he was 16. He and a friend named Walter Moore spent a lot of time tooling around Spartanburg, S.C., in that vehicle -- when they didn't have to dodge the local police. "I bought a '34 Ford sedan -- a two-door sedan -- and that was my street car," Owens said. "I was a terror, which you couldn't do today. You could do a lot more than you can now, as far as learning to drive on the streets." Owens eventually gravitated towards racing -- first as a driver with more than 100 feature wins and two NASCAR Modified championships, then as a mechanic and championship car owner. For his contributions to the sport, Owens was named as one of five persons nominated this year for possible induction into NASCAR's Hall of Fame. 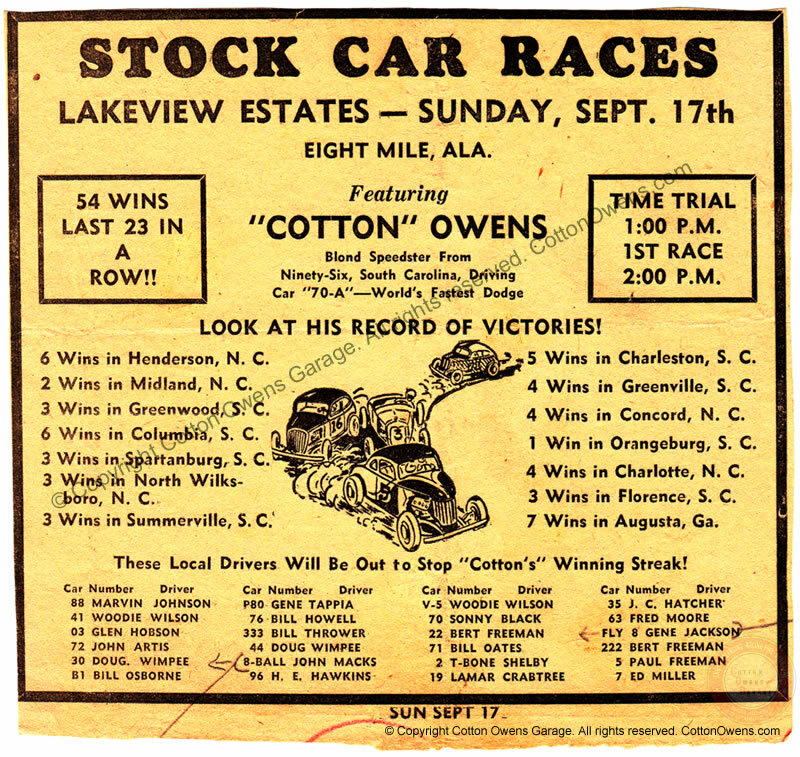 But it wasn't until 1940 that Owens got his first glimpse of stock car racing. It came when Bill France and several other top drivers arrived in town to race at the famous fairgrounds track. "I had to climb the fence to see that race, and I fell in love with it," Owens said in a story written by freelance journalist Cary Estes. "I'd seen some midget races, but I hadn't seen any stock cars. I watched that one race, and that's all it took." But shortly thereafter, the war intervened. Eventually, Moore went off to fight in Europe, where he participated in D-Day and the Battle of the Bulge. Upon his return to Spartanburg, Walter -- better known as "Bud" -- and Owens found jobs at a local junkyard. One day, a driver came in with a race car that had been damaged in an accident and needed a new body. Owens and Moore did the work, the car won the next race, and the two friends realized they had a skill that set them apart. Not only was Owens a talented car builder, but he excelled on the track as well. In 1950, he won 19 consecutive races, then later added the 1953 and 1954 Modified championships -- earning him the nickname "King of the Modifieds." "I did have quite a bit of success in the Modified division," Owens said. "We used to have the U.S. 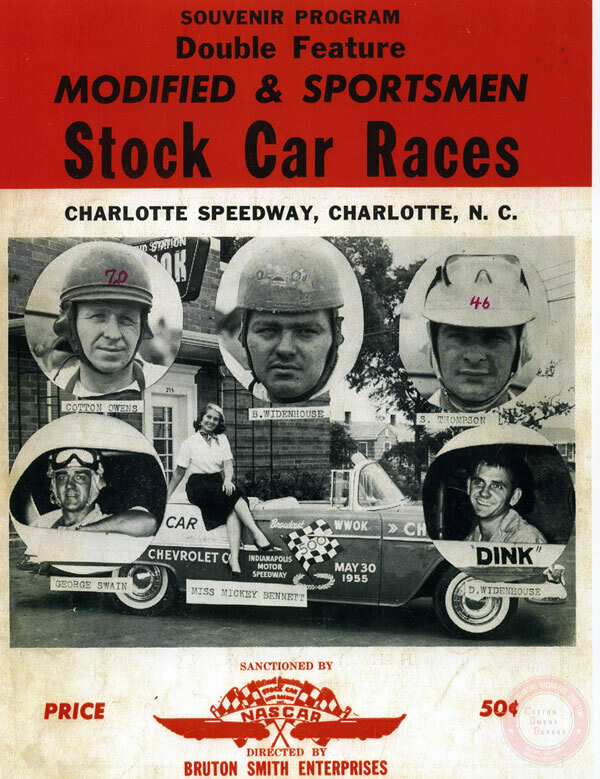 Modified championship race that Bruton Smith used to put on in Concord, N.C., in those days. I won four of those, against drivers from all over the United States. "When you win, that's nice, but when you do it more than once, that stands out. It was poor man's racing, but we ran pretty near all over the East Coast. It was a good division back then." But Owens realized the money -- and the fame -- was in NASCAR's premier series, known at that time as Grand National, and by 1957 he had switched his allegiance. It paid off handsomely with a win on the Daytona Road and Beach circuit to start the year. He added a victory in each of the next three seasons -- finishing second in the points to Lee Petty in 1959 -- and won four races as a part-time driver in 1961, including two at Columbia and one at his home track in Spartanburg. However, Owens hung up his helmet for good in 1964, shortly after getting in a car and beating David Pearson at Richmond in an effort to teach the young driver a lesson in maximizing his potential. Owens admitted lingering injuries from a serious crash a decade earlier was the major reason. "I had a bad accident back in 1951 that pretty near wiped me off," Owens said. "I had a broke neck, and completely distorted my face -- my head was as big as a wash tub. That left me with double vision. "I never did tell anybody that I was actually closing my left eye and [driving] with my right one. But in doing that, my depth perception was way off and I was running over too many people. ... At those speeds you need to focus in your mind and know that depth is what it is." The lesson Owens taught Pearson sunk in. Pearson won 15 times on his way to the 1966 Grand National championship in Owens' Dodges. In all, cars owned by Owens -- driven by the likes of Junior Johnson, Bobby Johns, Mario Andretti, Fireball Roberts, Bobby Allison, Buddy Baker and Pearson -- accounted for 38 wins, 177 top-five finishes and 241 top-10s in a total of 405 starts. But for his money, Owens said Pearson -- another kid from Spartanburg -- was far and away the best of the bunch. "Pearson could run dirt, asphalt, short track, superspeedway, road courses," Owens said. "He could run anything he set his mind to. I'd say he's one of the greatest. In terms of percentage of race wins, for the races he ran, I'd say he's the greatest of all time. "He was awful hard to get excited about anything. I'd say he was one of the coolest guys, as far as driving a race car, that I've been around. When he first started, he was like everyone else. He didn't take care of the equipment. But he learned what his equipment would take, over time. I would say his alertness, and his depth perception, made him more than 100 percent as far as his talents as a race driver." Pearson and Moore were inducted into the NASCAR Hall of Fame in 2011. With Owens' name added to the list of nominees, it wouldn't be a surprise to see a third Spartanburg legend join them there very shortly. Third in a weekly series on the most recent nominees to the NASCAR Hall of Fame.